Cryptocurrencies present a compelling solution for more democratization in the investment space. While the financial services industry plays an essential role in the funding and creation of new ventures, these firms are monoliths and the barriers to entry for new players are too costly. Initial Coin Offerings (ICOs) are going to change all of that. But first, regulation of ICOs is needed, because even without government oversight, the core blockchain technology will eventually completely transform the financial services sectors. The question becomes how many people will be burned before then, and to what extent can we invite honest innovators to rehabilitate the technology. Under the supervision of a regulatory authority, like the US’s SEC, consumers will also have the security of knowing that their crypto investments are as protected as their traditional ones. With that assurance comes credibility and long-term stability to the markets that depend on ICOs. Why are ICOs a benefit over the current system? Chief among them is the fact that ICOs offer fast, decentralized transactions to consumers using crypto-wallets. This streamlining eliminates middlemen — i.e. much of the financial service sector — further reducing overhead costs, while also mitigating exchange rates and transaction fee payments. A common perception of early adopters of cryptocurrencies, and by extension ICOs, is that regulation is decentralized and disorganized. As such, investors in the cryptocurrency space either attempt to actively thwart the regulatory framework or are unaware that regulation currently exists. Some cryptocurrencies act like stocks, offering dividend-style payouts for token holders. Aureus, for one, announced in May a new structure for its cryptocurrency that yields monthly Bitcoin dividends to all token holders. However, there are some bad actors too. Notably, the SEC has maintained that economics are what determine a security, not the technology. For many, last year’s $50 million hack of The DAO served as a wake-up call. The SEC intervened with swift vengeance launching a campaign designed to strike fear into nefarious token sellers. 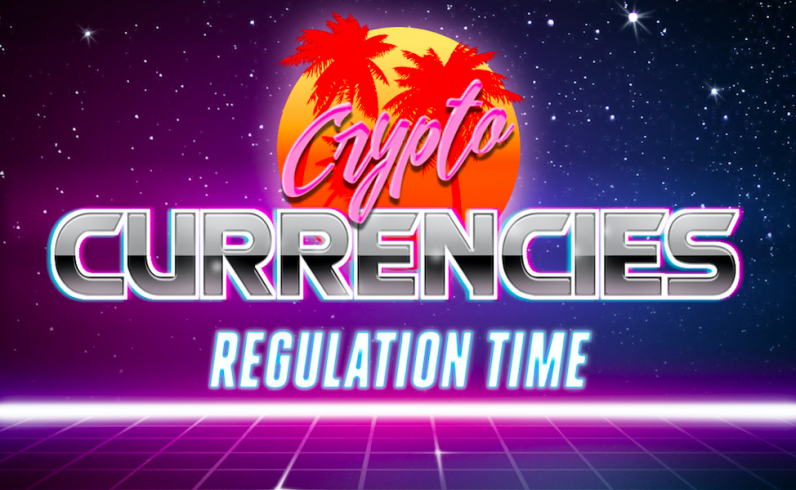 How does regulation affect the cryptocurrency market? Still, the question lingers: how would such oversight affect the cryptocurrency market? While substantively unclear, SEC involvement certainly portends a shift away from a the wild west token market. This resulting stable paradigm should usher true innovators into both the token development and blockchain technology spaces. Within the industry many voices champion SEC involvement due to this aforementioned marketplace volatility. Barry Silbert, Founder and CEO of DigitalCurrencyGroup which manages Grayscale, the operator of Bitcoin Investment Trust tweeted on July 25th, “Punch bowl taketh away,” a veiled approval indicating his belief that the SEC is committed to shoring up cryptocurrency volatility in the wake of the DAO ruling. Stability, and more importantly security, will lead to widespread cryptocurrency acceptance among larger, institutionalized players. Regulation will also make it safer to pay investors, vendors, developers, employees, all in cryptocurrency, eliminating the need to set up traditional financial services middlemen. While regulation may cause the feverish climate around cryptocurrencies to abate, the trade-off is that more legitimate companies will have increased interest. Simply put, regulation will help democratize investing. First, because ICOs have the potential to lower business cost, they simultaneously stand to lower initial share costs and subsequent costs down the value chain, opening the option of investing to a wider audience at lower buy-in rates. The effect that this will have is truly transformative. A broader, bespoke class would for the first time be able to participate in revenue sharing streams traditionally reserved for high-wealth individuals and institutional investors. Second, the structure of ICOs allow individuals to trade individual-to-individual, without the traditional stock exchange entry barriers. Perhaps unsurprisingly, consumers and companies in the video game industry are already accustomed to using and trading virtual currencies. It’s not a stretch to make the claim that videogames are the foundation of digital economies — where millions in fiat cash have been used to prop up entire marketplace universes. This uniquely positions the gaming industry to adapt to an ICO model for funding game development, as well as to serve as a model for other industries interested in expanding into this arena. ICOs are the natural evolution of the Jumpstart Our Business Startups (JOBS) Act equity crowdfunding model. The ability to publicly crowdfund, namely to solicit cash, has lionized interest in campaigns and platforms, leading to a new “golden age” of democratized investing reliant on a technology that caters to public interest as much as it financially benefits its developers and publishers. The bottom line is simple: considering most cryptocurrencies and ICOs are structured and used nearly identically to common stocks plus some nominal utility function, we can expect greater SEC jurisdiction to be exerted in the near future. That the SEC has already issued guidance on ICOs is a positive first step, but there are still loopholes in how ICOs talk about themselves to potential investors which need to be resolved. But, once we are in a place where ICOs are regulated and begin to be adopted by institutions, the radical transformation of our financial services industry will be unstoppable. This change will benefit consumers by making investment easier and safer, and it will fund a whole new wave of small companies and startups eager to court new investors.